The familiar layout and aesthetics are there, with small, almost imperceptible visual changes, at least when it comes to defaults. 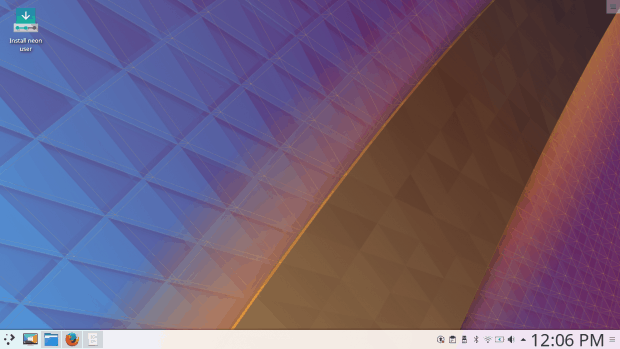 The wallpaper is new, but again, the essential KDE-ness is there, and ’tis an important factor in brand recognition, regardless whether it’s software, cars or music. 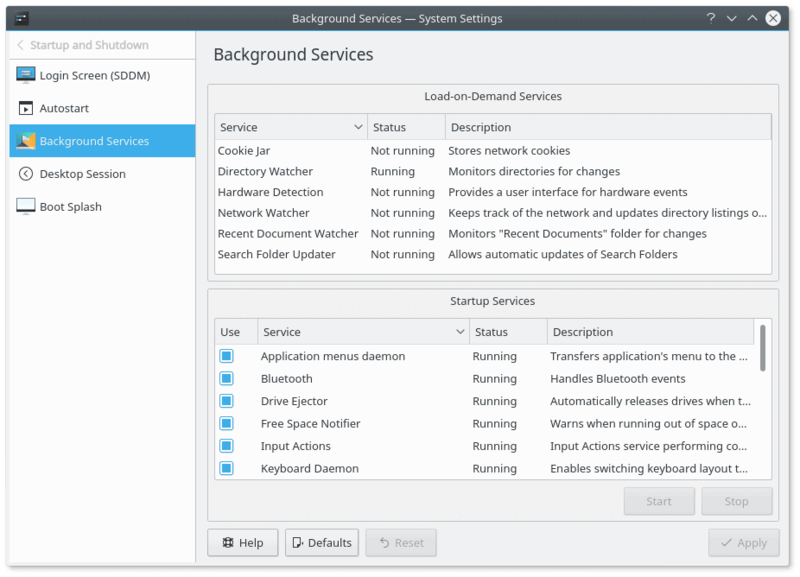 I started by doing the mandatory network connectivity thingie – and I got two prompts for Wireless, which seems to be an old, lingering bug in the live session, in lieu of the KDEWallet prompt. 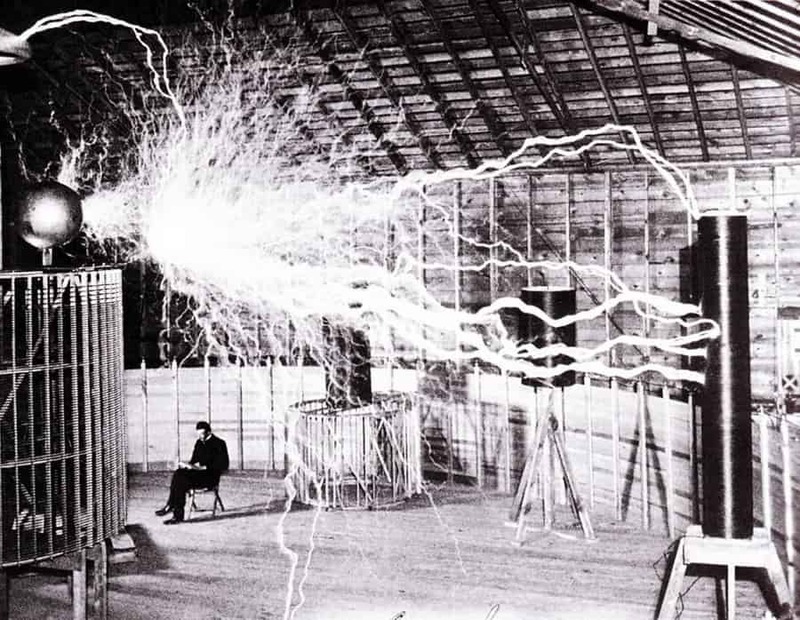 I’ve outlined this in my State of Plasma report, and indeed, that shall be my guiding beacon throughout this session, as we can check and compare what has changed in the last year or so. 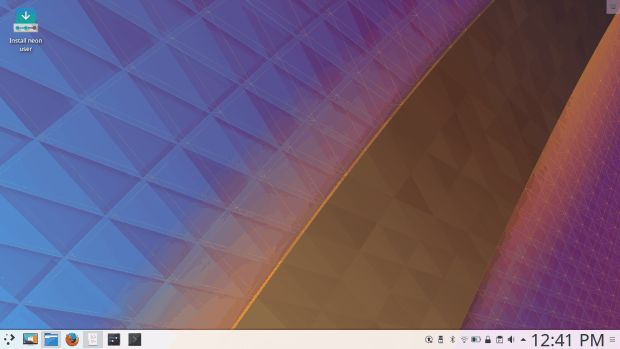 It is important to remember that KDE neon runs Ubuntu LTS core, so some of the stuff here may be distro rather than desktop related, however, most if not all of the stuff is pure Plasma. For instance, the Wireless prompt issue is pretty much consistent across multiple operations systems. Still, it’s really unnecessary, and it’s not the best way to start the session. Speaking of Ubuntu – and hardware and drivers – the HP laptop comes with an interesting array of technology, including the first-gen i5 processor, an Nvidia card and Broadcom Wireless drivers, and this is something we will also need to look at here. But first, let’s focus on the goodies that 5.11 bringeth. This is one of the prominent new features. 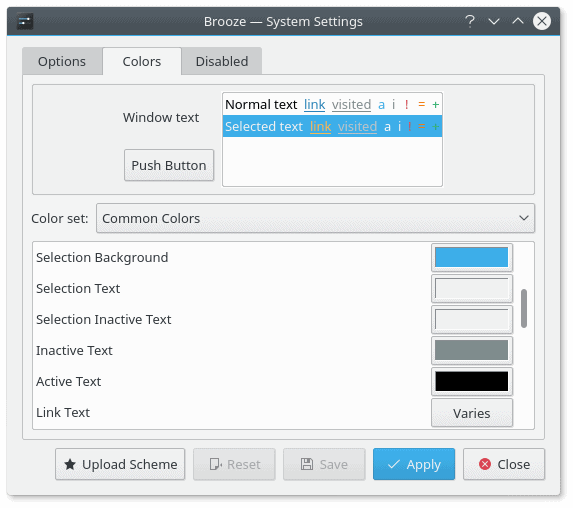 Somewhat similar to what Nomad slash Nitrux does, the settings menu is now horizontally hierarchical. Previously, you would click through categories and they would open in the z dimension. Now, it’s all about the x dimension. On one hand, this makes the settings menu easier to use. You have the sidebar with options, and you have better visibility of the available tools and features. However, the usage is not consistent. Some of the categories open with the sidebar in place. Others superimpose a new sub-section of categories, and you have the back button to navigate one level up, however the visual displacement can be somewhat odd, especially since you might not expect it. A matter of consistency, if you will. The bigger issue is that the horizontal space is now – more – limited, so when you open some of the categories, the GUI is actually truncated. I’ve mentioned this before, but now we have a whole new dimension of cropping issues, because we have this new visual arrangement. The subtle problem of relative placement remains. Sometimes, you have more than an integer value of lines of text or entries shown, and some are ever so slightly cropped, and when you expand the window vertically – or horizontally – they scale up in a non-linear fashion, so you’re never quite sure what the perfect window size is to get all the options you need without any ugly truncation. There are other small visual papercuts related to borders, double borders, a few misaligned pixels, and such. Other than that, the new settings menu is reasonably good. The options are there, and there are a few new sub-categories, making system management even more granular and intuitive. The plethora of tools, and your ability to control the behavior of the desktop are truly remarkable, and after using KDE, all other desktop environments feel very constrained, very limited. Welcome to Fort Tux. Now, that’s an awesome joke, savvy? 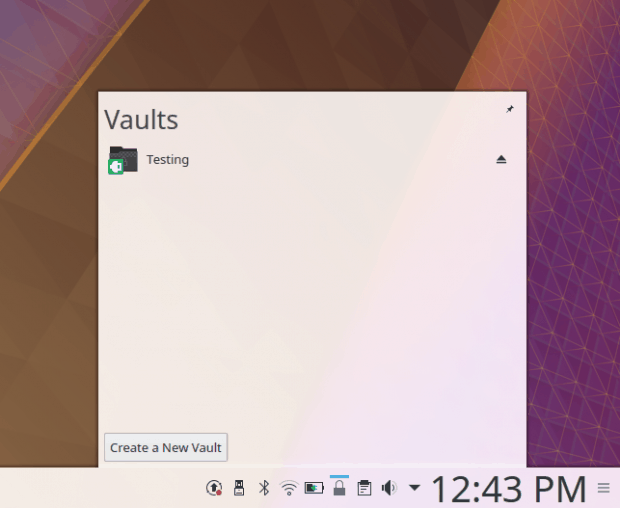 Plasma 5.11 ships with a new container-based security mechanism called Plasma Vault, allowing you to create Vault – file-based containers – inside which you can store and keep sensitive files and data. Rather than encrypting your entire disk and/or home partition, you can go with a more granular method of keeping only individual files and folders protected. Think TrueCrypt containers. 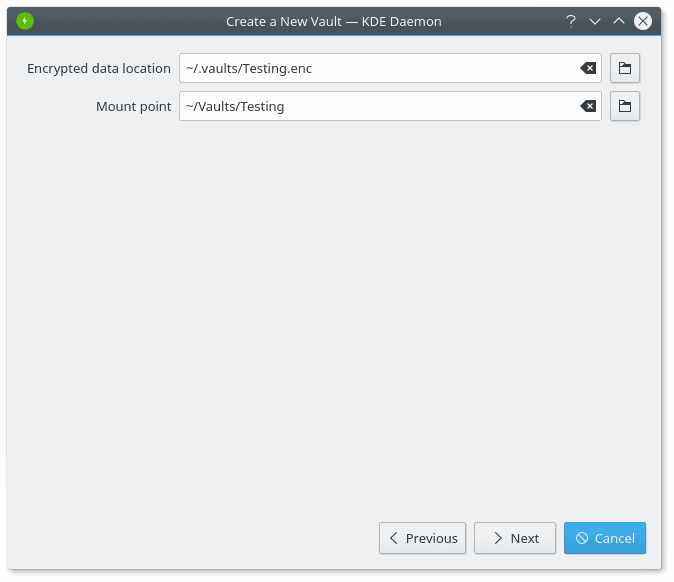 The difference is, Vault forms an integral part of the desktop environment, so the usage should be seamless. Indeed, Vault allows you to create multiple, eh, vaults on the fly, name and place them where you see fit, even associate them with specific Desktop Activities – remember the incognito mode as I’ve highlighted in my review – so this is a very cool option. 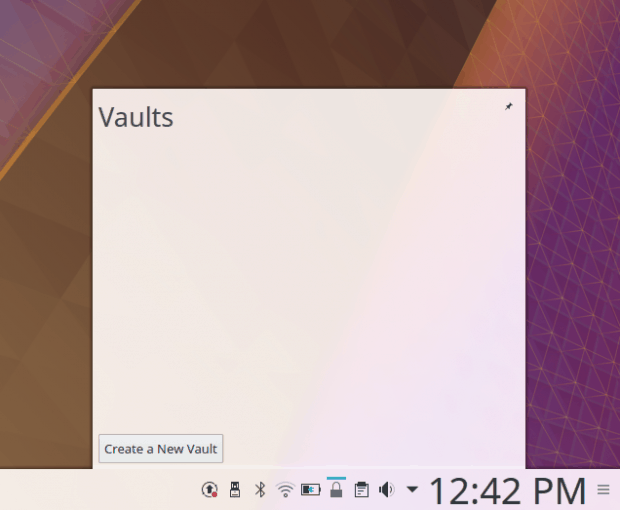 The vaults can be mounted and unmounted through an applet in the system area. Very convenient. Very cushty. Only, the implementation isn’t quite as good as the official release notes screenshot demo. 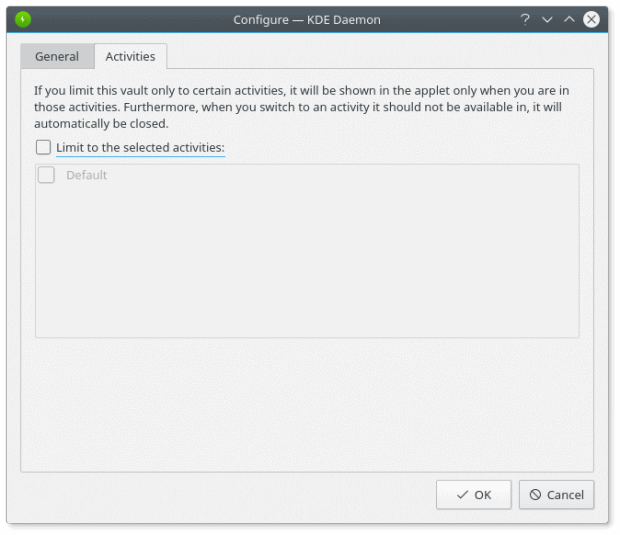 First, at the moment, there’s no Vault available in the User edition – by default, it only ships in the Developer edition of KDE neon, which is intended for software loving people, and that brings its own risk of instability. 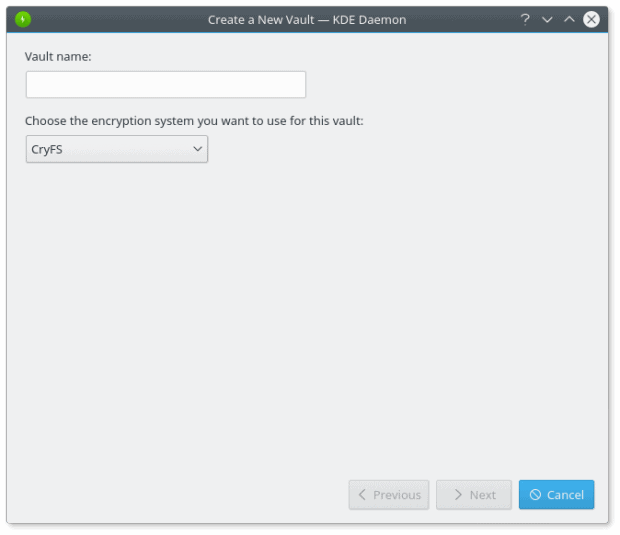 Second, you can install Vault manually (the package name is plasma-vault), but then you will be warned that one of the encryption methods is insecure. Why include an insecure cipher and the warn about it? This is alarming. The warning during the installation does not let you know that you can use TWO other encryption methods, one which has been audited and found secure, one experimental, a big no no with production data. All you get is this banner that deters you from testing and using Vault. Once I had Vault installed, there’s no mention how it should be start. It wasn’t showing in the system menu, or in the system area. It wasn’t listed as an extra entry. I realized I may actually need to log out and log back in to see the changes. Vault is not showing (yet) in the system area list. Then, the desktop refreshed on its own, and I had the padlock icon in the system area, which meant Vault was now active. It took about three minutes for this to happen after the installation. Again, this is far from being perfect, and it spoils the actual value of the utility. Notice the Vault padlock icon in the system area. Finally I was able to test Vault. Once you ignore the installation glitches, it works really well. Click on the icon, start creating vaults. Name them, configure the actual location of the container, password protect it, set the mount point. You can also configure advanced options like the desktop activity associations. Then, you can mount the created Vault(s). 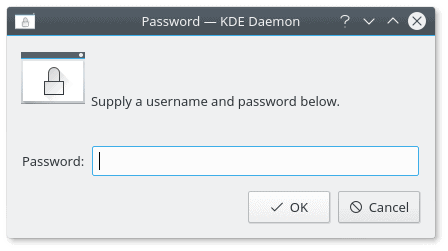 The password prompt has a bug, as it asks for username + password, but you’re only required to provide the latter. After that, you will get new Dolphin windows, open to the location of the Vault. You can now start storing files, like you would with any folder. Once you’re done, unmount – or rather eject – the relevant Vault. Job done. The prompt asks for username and password, but it only needs the latter. Very nice. I like this. My test shows this works fine, and there are no immediate, horrendous bugs or performance impact due to the encryption layer. 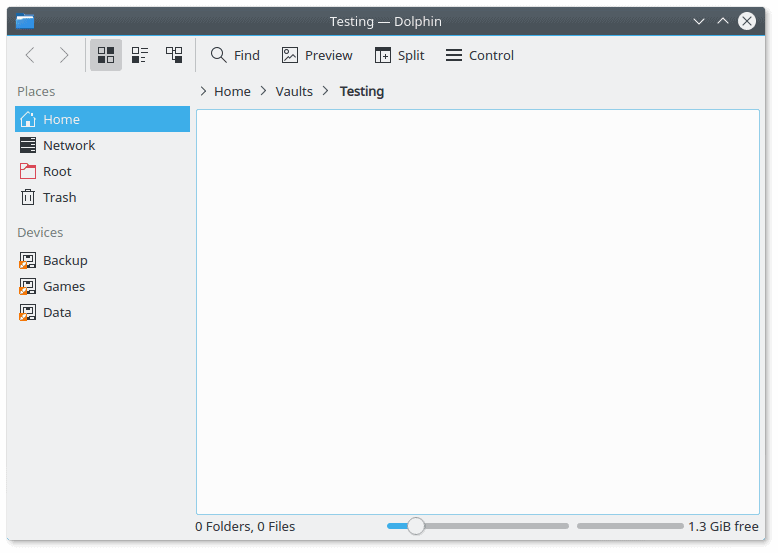 The only thing that is annoying is that Dolphin lists all available devices in its side bar, and even if you may have hidden some of the entries in your ordinary file manager, they will nonetheless show here, when launched through Vault. Blistering fast. 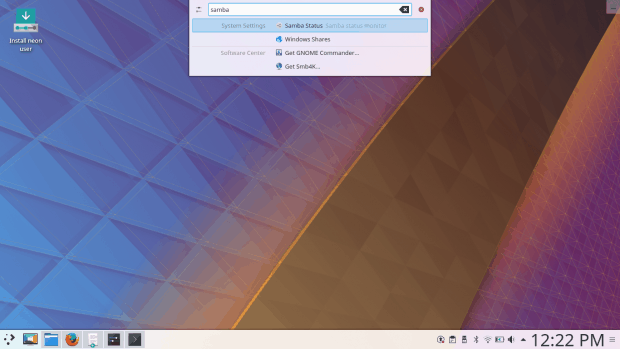 I was amazed how lithe and fast and elegant Plasma 5.11 is. Even running from the thumb drive, it was extremely responsive. I was also surprised by the browser performance, and in this case, it includes Firefox 56. But in general, everything desktop-wise was peachy and fast. Memory usage is about 600 MB, which I cannot compare with the Lenovo G50 laptop, but the numbers are not as high as most other distros tested under similar conditions. This is with the Nouveau driver, not the official Nvidia blob mind, which normally gives you even better performance and a fractionally lower memory usage. CPU wise, the numbers ticked around 1-2% on idle, often less, rarely more. Surprising and refreshing. There’s also Wayland in the equation, so things are looking good so far, and when praise is due, it’s due. Krunner works fine, and it’s moderately intelligent and useful, with some extra powerful features and then some rather ambiguous choices. For instance, when I searched for Firefox, it did let me visit pages available in the browser history, but it also offered to install stuff through Discover. Similarly, when I searched for Nvidia, it offered to install the Nvidia Settings tool but not the drivers themselves. I never quite figured what the developers meant with Folder view or the new task manager settings. 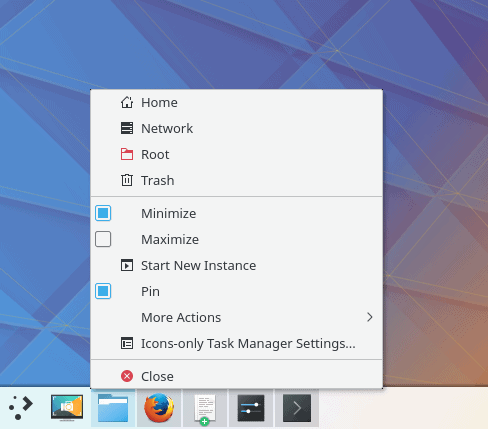 I was running the desktop with the icons-only alternative, and while some programs did have custom entries, I didn’t see anything special, or ways to add new functions. I know this can be done by editing the configuration files, but that’s not the point, and it does not align with the advertised features of the 5.11 release. New notifications! 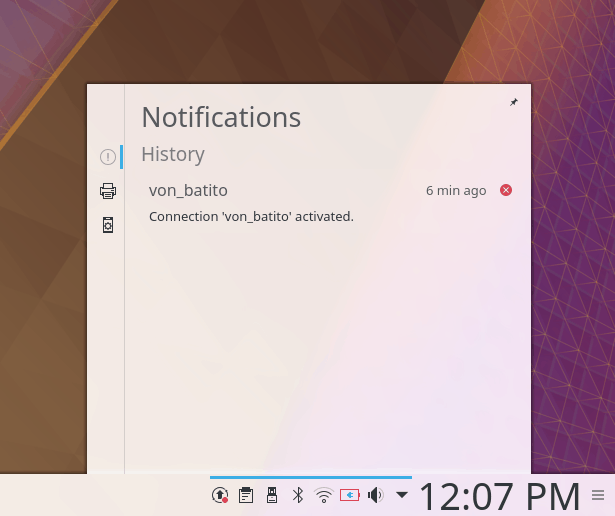 New notification history, somewhat more user friendly than in the past. I also think it’s not possible to shuffle and re-arrange open window icons in the standard task manager. The progress bar on file copy in Dolphin seems to be gone, which is a big shame, as it was a really nice feature. Or it could be a temporary bug. KWrite opens new items as windows rather than tabs. 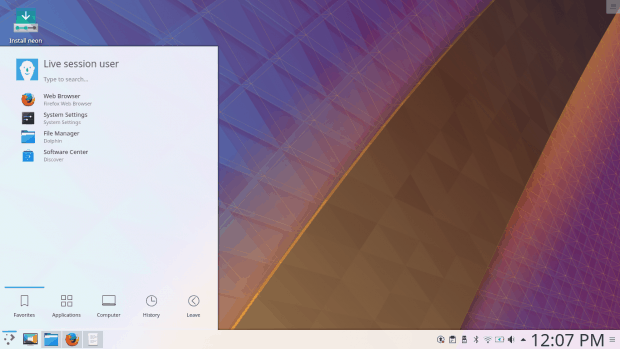 Screen brightness dims after a short period of inactivity, but then, when you resume working on the desktop, the full brightness level does not come up quickly enough – the transition is gradual, over a period of three to four seconds whereas Kubuntu does this instantaneously. Worth checking what gives there. Lastly, the boot sequence was a bit odd – the circular neon logo first showed squashed, low-res, then there was some flickering and text, then we had the hi-rest logo, more text, and finally the desktop came up, and this with Nouveau and not even Nvidia. I’m sure this can be quickly sorted out with some attention and love. Well, yes. Quite a few really. You still cannot play media files directly from Samba shares, and you will need to configure the SMB access module in VLC – this is the default player provided with neon – before you can enjoy your music and videos. This is quite pointless. On the same note, the Samba timestamps bug also remains. When you copy files to a Windows share, the files will be created on the remote filesystem with the current stamp. Utterly unnecessary, and it mars the professional sheen of this otherwise rather splendid desktop environment. 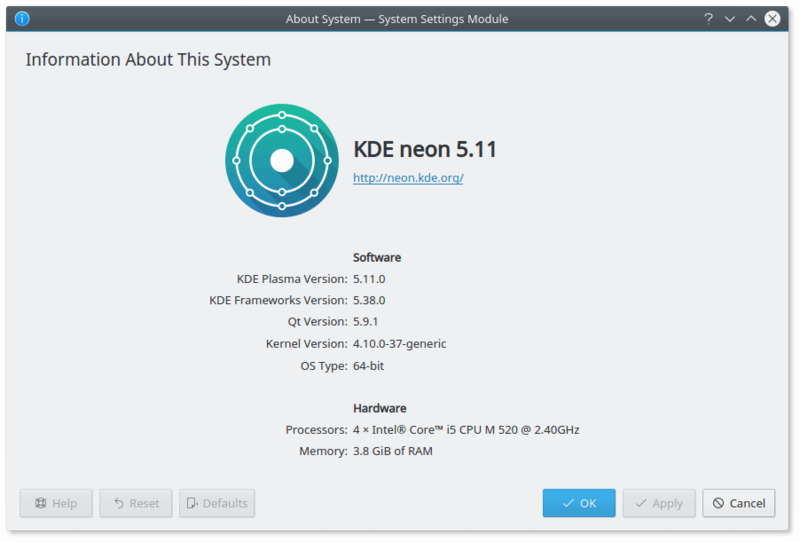 KDE neon also does not ship with any drivers utility, at least not in the live session, so it did not prompt or ask me to install proprietary drivers, which would be a nice thing to do. 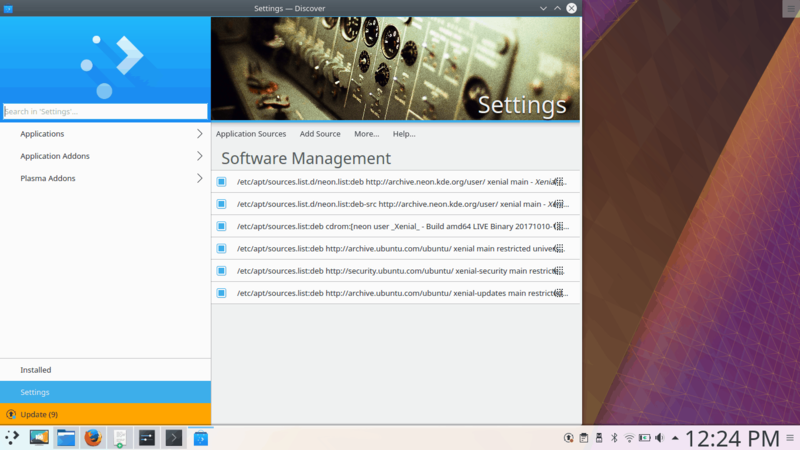 Ubuntu as well as Kubuntu definitely offer this functionality. So it’s not a Plasma thing, but how can the user know? In this regard, they may accidentally blame the environment for the lack of additional, expected functionality. 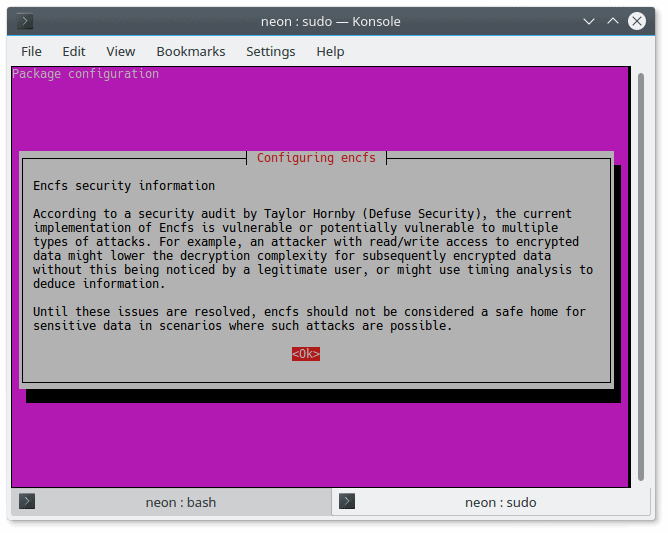 Furthermore, KDE neon is the flagship demonstrator, so it might as well nail that first impression. Even more so, since it’s Ubuntu-based, and there isn’t any excuse not to have what Ubuntu does by default anyway! Screenshots still come with shadows. 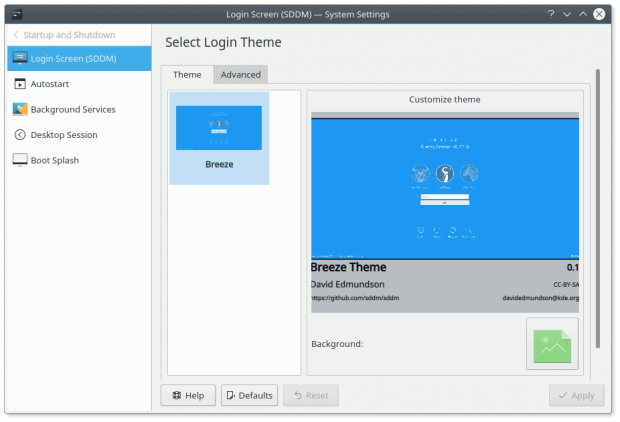 Themes and icons can be installed through the integrated system tool, but most return API errors, and even some that do install do not show up later. 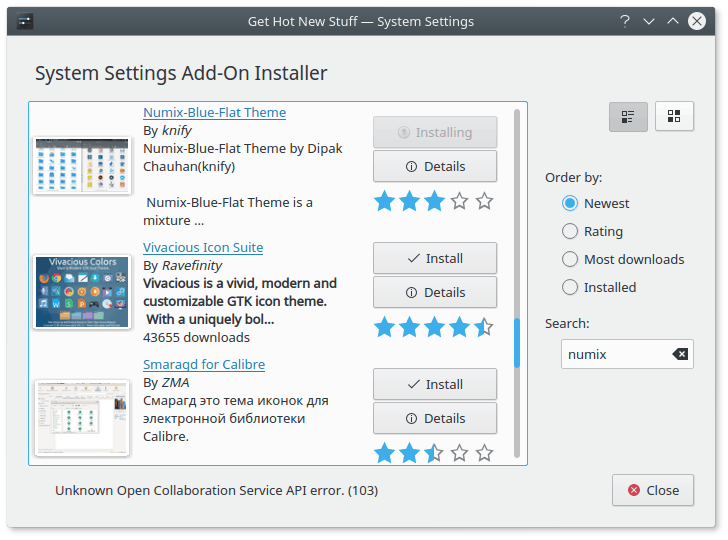 For example, I tried a variety of Numix themes, and none of them were usable. Some of the available entries are for KDE3.5 and KDE4, and they have not been updated in years. There really should be one big all-year purging of all these leftovers, because they are just wrong, and they hurt Plasma. 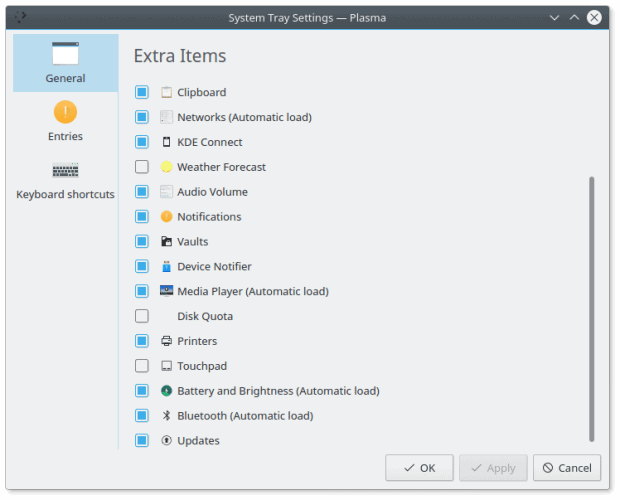 The mess that is the Plasma theme & icons management engine. 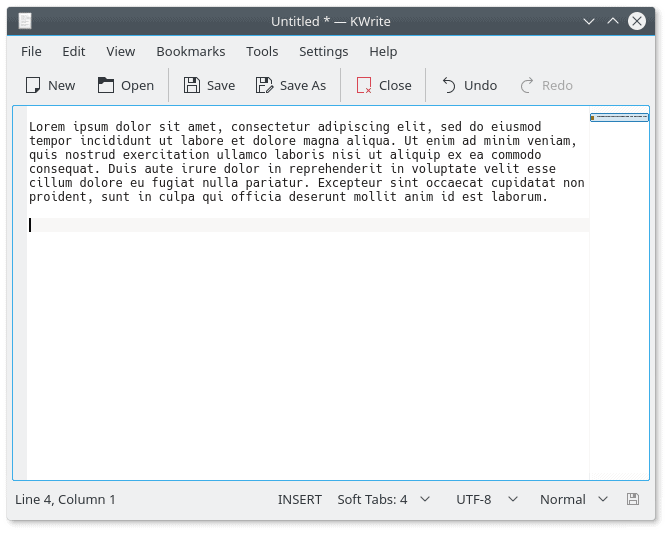 The quality of fonts is reasonable – surprisingly not identical to Kubuntu, which gives a superior performance on this very platform, but then, in Kubuntu, I’m using the Nvidia driver and this could have an effect. Manually changing the AA settings also improves the rendering – with RGB and slight hinting values as the preferred options. All in all, not bad. Browser fonts with manually configured AA settings (RGB, slight hinting). However, font color and contrast are in need of an improvement. I had to change the theme and set the text color to pure black, and this provides an immediate ergonomic boost and helps reduce the strain on the eyes. 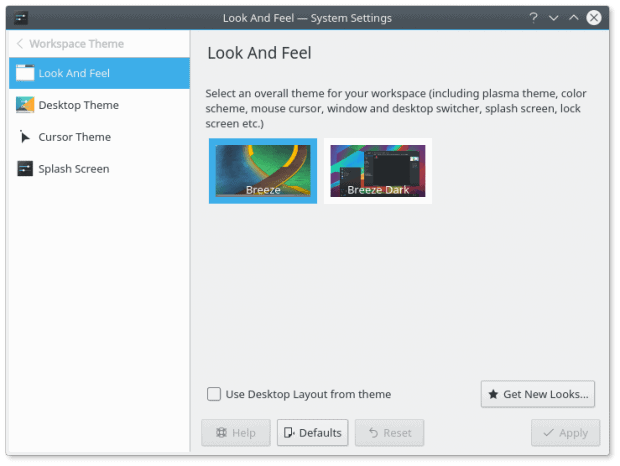 I really don’t understand why distros don’t use simple black color for fonts. Everything else is configurable but the text should be crystal clear. I like black fonts and I cannot lie, all you users cannot deny. 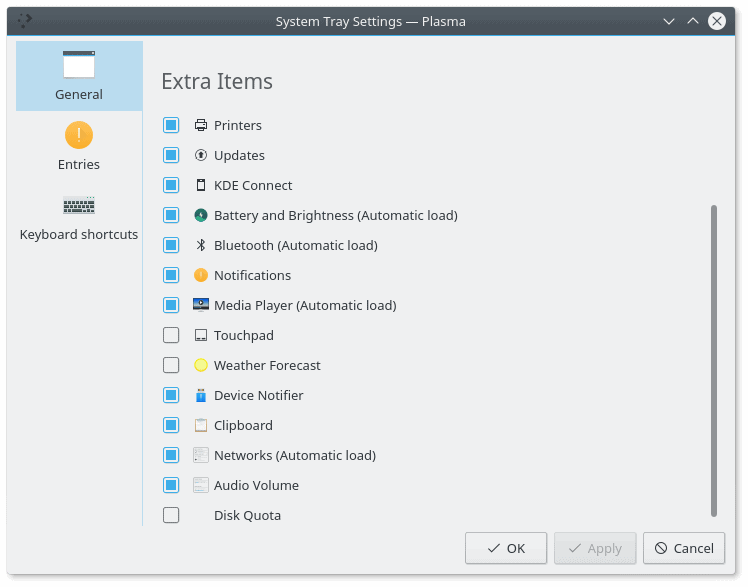 The default Plasma package manager remains disappointing. It has benefited from some tiny changes, but far from enough to merit sustained use. It still feels half-finished, too generic, and the settings page is simply not usable. Configuring new repos is a big pain. I really don’t understand this, and why it does not get more focus. 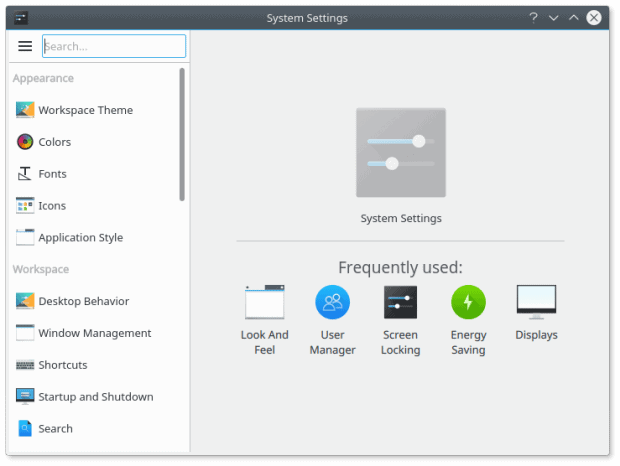 New users will exclusively go for a GUI manager, and their first experience with Plasma will not be a positive one this way. Let me ask you, what’s more important new features or old bugs? I think it’s the latter because enthusiasm comes in spikes and quickly fades away, but resentment is a cumulative emotion, it just builds up. Plasma 5.11 is a very nice release, but I think it should be fix-first new-second. When I started exploring the desktop environment, the first thing I wanted to check was if the old, outstanding issues have been ironed out. And then, there was the moment of disappointment when I learned they have not. This diminishes the power and value of the new features introduced in this edition. Plasma 5.11 is fairly consistent, robust, good looking, blazing fast. Vault is a nice thing. I’m not entirely sure about the system settings, and this merits longer use before I can decide. The rest of the stuff seems less important. Then, we have new glitches, which is bad, and old bugs, which is sad. Hopefully, the KDE team can keep the momentum. Overall, Plasma is a shining star in the Tux Galaxy, and it would be a shame to see it go supernova. So yes, I do like this release, and I’m waiting for it to be officially rolled out into the distro repos. And then, on the same note, I’m also waiting for when I will be able to play music from remote shares without thinking, and the moment no old bug will ever resurface. 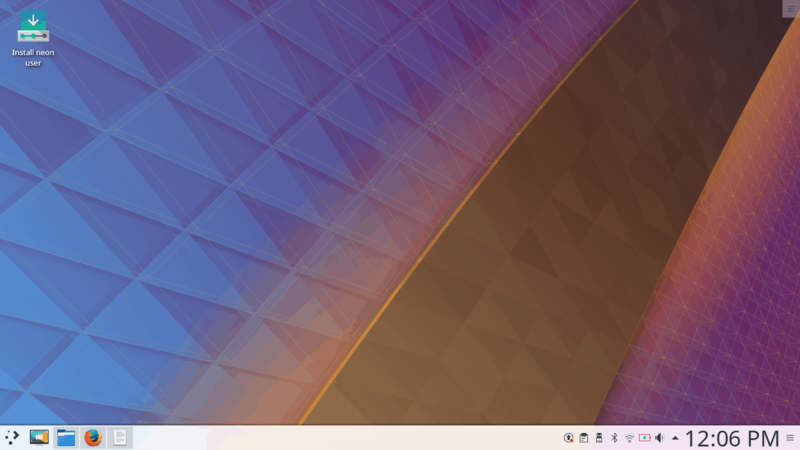 Hopefully, those two will coincide, and that will be the release date of Plasma 5.12. For now, we have 5.11, and you should test it. Recommended. Peace. Even worse, if someone – or a troll or bot – makes a comment on a 10-yr. old entry, it will just to the top of the “latest updated” category because of the new comment activity, even if the file(s) itself has never changed in all that time. Very bad idea. 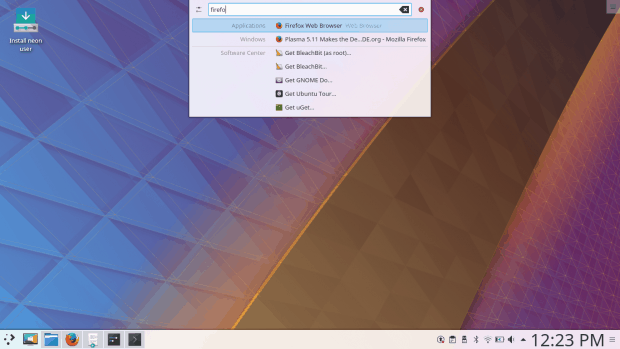 Having said that, the entries are owned by the OpenDesktop project and the respected authors, and not KDE – so how to fix? I’m guessing a script could be written to move anything older than a certain date to the legacy category? Not sure that would work either, but off the cuff I have no other ideas. The only other option would be to move Plasma specific things out of the OpenDesktop framework and self-host and regulate it. Wouldn’t be a bad idea. There are tons of ways to make this work. 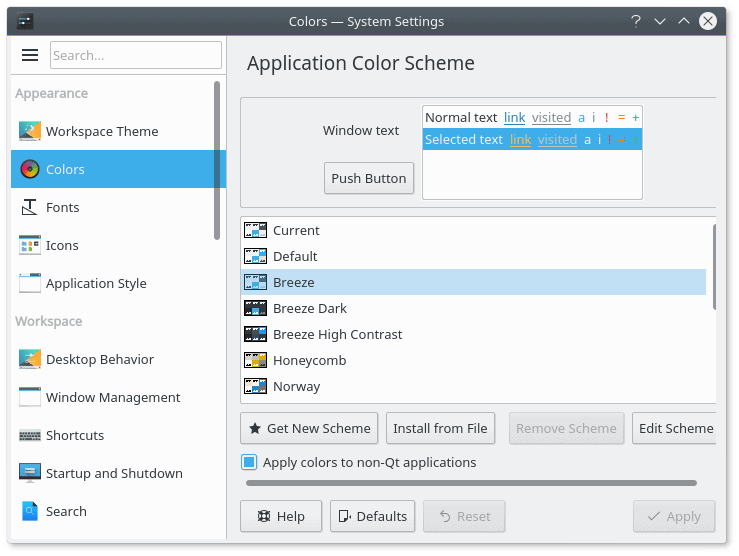 KDE/distros maintain a small section of these add-ons individually. The Plasma API checks various attributes, like the ones you mentioned, and filters accordingly. Plasma maintains a blacklist of packages that fail to install, and simply removes them from its index. Moving forward, a strict format for what needs to be added, how the manifest is declared, and what constitutes an active project to warrant inclusion – and maintain that inclusion. But then standards are the biggest problem for pretty much anything desktop, and if there were some, we’d all enjoy better quality – and maybe even cross-distro/de usability. Thanks for another great article. My favourite blog! 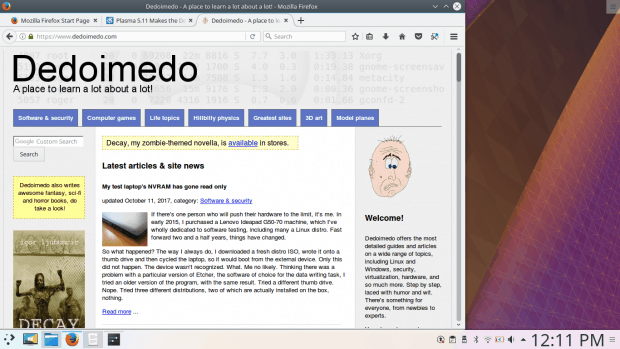 I tested 5.11 on Fedora 27. I couldn’t agree more on the comment regarding fixing old bugs. On the other hand I am loving the speed and low RAM utilisation of Plasma these days. Such a pleasure.